We will punish soldiers who divulge sensitive information, Nigerian Army says – Royal Times of Nigeria. 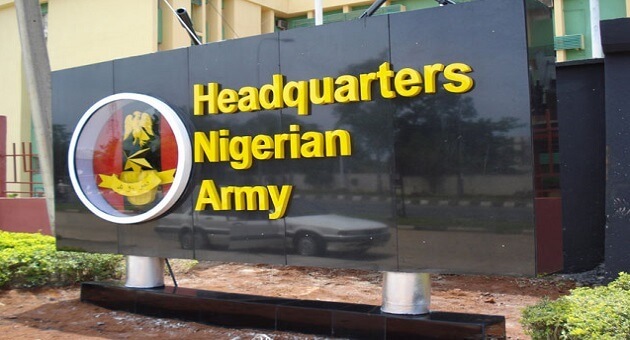 The Nigeria Army says it will henceforth severely punish any soldier found to have divulged information on ongoing military operations without due clearance. The Army had in recent past been accused of breach of human rights laws and rules of engagement in some of its operations especially in the North East and South East regions of Nigeria. The accusations were largely based on information from concerned personnel in the military. According to a nine-point communique issued at the end of the 2017 Chief of Army Staff Annual conference held in Ibadan, Oyo, the Army said the resolution is in line with the 1962 Official Secret Act. The conference said commanders must henceforth strictly employ established Rules of Engagement, acknowledging the need for its operations to be conducted within the context of the rule of law and international best practices. 1. The Chief of Army Staff’s Annual Conference 2017 held at the World Lilies Events Place Apata, Ibadan from 10 – 14 December 2017. The Theme of the Conference was “Re-appraising the Nigerian Army’s Operational Efficiency in Combating Contemporary National Security Challenges”. The Conference provided an opportunity for the Nigerian Army to review the major events that took place in the Year 2017 and made projections for 2018. The deliberations at the Conference indicated that the Nigerian Army has fared better in the areas of training, operations, discipline and force posture which are essential ingredients for any virile and professionally responsive army. 2. The only lecture titled “Safeguarding Nigeria’s Unity and Sovereignty: A Patriotic and Constitutional Imperative for the Nigerian Army” presented by Major General Ike Omar Sanda Nwachukwu brought out the need for total National Defence and total intelligence-gathering based on total National Defence consciousness. The Conference recognised the critical roles of responsive and effective leadership in the efficient management of available resources in the discharge of the constitutional roles of the Nigerian Army. 3. The Conference took cognisance of the fact that the Nigerian Army must sustain the investment in personnel management by continuously creating responsibilities, providing direction, inspiration and vision for all categories of personnel and at all times. This is with a view to confronting and combating all evolving internal and external security threats in order to guarantee the sovereignty of Nigeria. To this end, the need to maintain the high morale of Nigerian Army troops remained a focal point in the deliberations at the Conference. 4. The Nigerian Army noted and reiterated the need for continuous self-assessment of its capabilities vis-à-vis ongoing operations with a view to optimising existing capacities while strategising for increased combat efficiency. Critical thinking by all officers was identified as a means necessary for projecting the Nigerian Army to greater heights. It also highlighted the need for collaboration with sister Services, paramilitary and other security agencies for a robust security architecture capable of dealing with existing and emerging security challenges. 5. The conference also deliberated on issues impacting on the conduct of ongoing Nigerian Army operations and the need for such operations to be conducted within the context of the rule of law and international best practices. Human rights issues were also discussed which brought to fore the need for commanders at all levels to abide by extant rules in fulfilling Nigerian Army’s obligations to the citizenry especially the strict employment of established Rules of Engagement. Civil-Military Relations was highlighted as part of Nigerian Army’s efforts to integrate and relate to the general public especially host communities for the winning of their hearts and minds. 6. The Nigerian Army identified the need to explore capacity building as a vibrant tool for efficiency in the conduct of its affairs in line with the Chief of Army Staff’s Vision which is “To have a professionally responsive Nigerian Army in the discharge of its constitutional roles”. The Nigerian Army’s sustenance strategy through Internally Generated Revenue (IGR) was discussed with a view to enhancing its self-generated revenue. Appropriate and timely government funding of the Nigerian Army was identified as a requisite condition for prompt successes in the conduct of operations. 7. The Nigerian Army identified the core values of discipline, professionalism and responsiveness as important benchmarks to reposition the Service being the “Pride of the Nation”. The need for effective maintenance culture, continuous infrastructural development and welfare of personnel in the conduct of effective operations was well brought out. In this regard, prioritisation and judicious use of available resources were encouraged for all officers at all levels of command. 8. The objectives of the Conference have been achieved as it was noted that the Nigerian Army has performed creditably in the year 2017. Far-reaching decisions were arrived at during the Conference. Lessons were learnt as drawn from the Nigerian Army operations and exercises such as EGWU EKE II and EX CROCODILE SMILE II conducted in the Fourth Quarter of 2017. Improvements in the exercises were projected consistent with the lessons learnt and as captured at the Nigerian Army Forecast of Events 2018. 9. The Official Secret Act of 1962 was to be applied strictly in the conduct of future Nigerian Army operations. It is the resolve of the Nigerian Army to remain responsive and apolitical while re-affirming its total loyalty to the President, Commander-in-Chief of the Armed Forces of the Federal Republic of Nigeria, President Muhammadu Buhari GCFR.